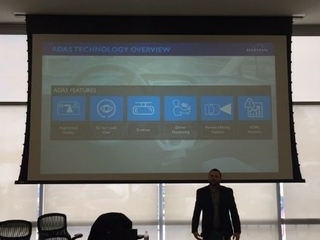 STAMFORD, CT -- HARMAN (NYSE: HAR), the premier connected technologies company for the automotive, consumer and enterprise markets, announced today that it will offer an aftermarket Augmented Reality (AR) Driving Device to automotive OEMs through a strategic partnership and investment in Silicon Valley innovator Navdy. As part of the agreement, HARMAN will have exclusive rights to distribute the new co-branded aftermarket Navdy with HARMAN device to automotive OEMs, specialty auto and audio channels as well as select mobile carriers globally. Introduced last month, the new Navdy product is the world's first aftermarket heads-up driving (HUD) device that projects both mobile application information and car data information directly over the road allowing drivers to Look Forward© while Staying Connected©. The aftermarket HUD solution leverages AR technology to project car, phone and music information directly in the driver's line of sight, creating a new type of driving experience that is both safe and satisfying. The initial offering will be a co-branded Navdy with HARMAN aftermarket device combining the innovative Navdy technology with the strength of the HARMAN brand. In January of 2017, the aftermarket device will be available direct to automotive OEM customers globally and to consumers in North America through well-known specialty auto/audio outlets. Product bundles with synergistic HARMAN products such as the JBL® Trip will also be made available in select markets. “We are pleased to partner with HARMAN, which brings a wealth of experience across brands, technology and global networks that will expand our reach. The product is available in North America with plans to extend to Europe, Asia and South America. 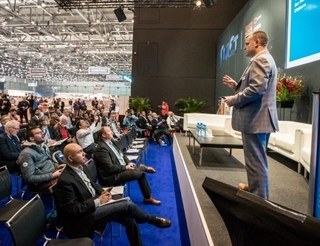 The Navdy with HARMAN device joins a number of automotive aftermarket product innovations from HARMAN’s well-known brands like JBL,” according to Doug Simpson, founder and CEO of Navdy. 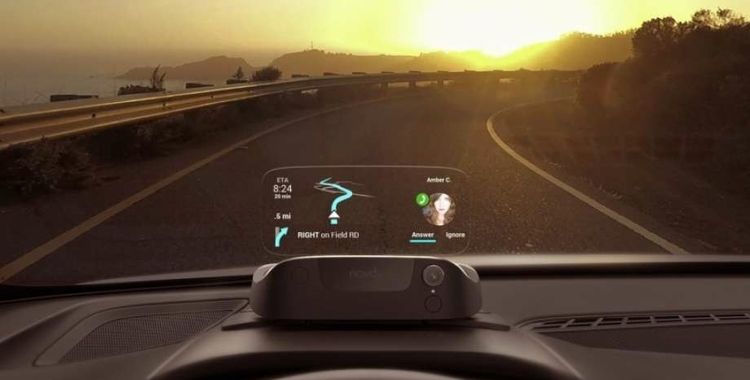 Navdy's breakthrough user interface projects a transparent image on the road ahead and incorporates advanced software that lets drivers interact with their smartphones hands-free using hand gestures to accept calls and respond to messages. Having maps, calls, messages, notifications, music, and car information projected directly over the road results in a safer connected driving experience. The augmented driving device software is also tightly integrated with the OBD-II interface of the car allowing access to important car information such as speed and fuel level on the transparent screen. “Consumers today are keenly aware of the risks posed by distractions due to mobile texting and phone calls while driving. They want products that make the connected car experience safe while increasing driver satisfaction. These are two reasons why Car Toys is seeing tremendous growth in Driver Assistance products and why solutions that reduce distracted driving are resonating powerfully with consumers. There is a lot of pent up demand for a robust HUD solution and we are extremely excited about HARMAN’s entry into the aftermarket category – especially with the powerful Navdy with HARMAN product. We are looking forward to offering our customers a product that makes driving safer and drivers happier,” said Jim Warren, vice president, merchandising & marketing, Car Toys. According to a recent IHS Markit survey, consumer demand for HUD technology is rapidly increasing. The survey found that 55 percent of new car intenders in the U.S. would like to have or desire to have HUD technology in their next car. Technology like Navdy is well-positioned to meet the demands of the growing market. Those interested in learning more about the Navdy with HARMAN device can view a video here and access product and purchasing information here. Navdy created the world's first Augmented Driving© device for your car that lets you Look Forward© while Staying Connected©. The company's mission is to reinvent the driving experience and to make driving something you Look Forward to again. In 2013, Navdy set out to fundamentally change the way you use technology in the car and to create the type of product that makes you immediately wonder how you ever lived without it. Navdy is more than a new display, more than a new UI, and more than a new platform for Apps -- it's an experience and one the company hopes you enjoy every time you get behind the wheel. With the strategic investment from HARMAN, it brings the funding total raised by Navdy to $42 million, which includes investments from Qualcomm, Upfront, Promus, Ludlow and others. To learn more, visit www.navdy.com.